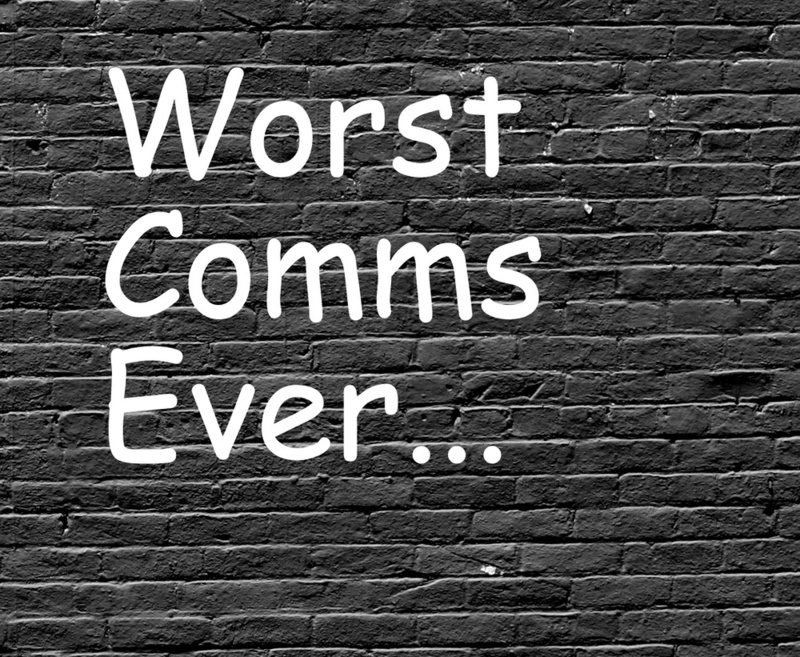 #comms20unawards: whats your worst comms of 2014? So, here we are almost at the end of the year. And what a year it's been. Some good. Some bad. For this comms2point0 unaward category we'd like to look at the really bad comms of the year. Worst comms of the year... that's quite a category to have a crack at. While the comms2point0 unawards are about celebrating the best we've also held one of the slots back as a kind of therapy session. It's WORST COMMS OF THE YEAR. Something so bad and so awful that it makes you just gnaw your leg off. It could be something that you've been on the recieving end of. Maybe an at risk letter typed in comic sans? Just y'know to lighten the mood. It could be the finest stretch logo you've ever seen. It could be the best worst use of an apostrophe's and bad grammar that you've ever seen's. It could be something you've seen on television or YouTube. It could even be the shabbiest idea you managed to head off at the pass. Whatever it is, you have two routes to do it. You can make a comment here or you can email us. You can add it anonymously. Or you can put your name to it. Either is fine. To email, drop a note through to dan@comms2point0.co.uk or darren@comms2point0.co.uk. Deadline is Wednesday November 12 at 11.59pm. We are indebted to the marvellous people of Alive With Ideas for sponsoring this category. Who are very, very good at doing comms and have amazing taste.